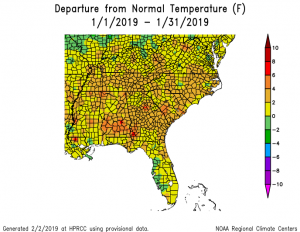 Above-normal temperatures covered Georgia in January 2019, with values ranging from one to four degrees F above average. Georgia started the year well above normal, but an outbreak of cold air at the end of the month brought the monthly average closer to normal. Rainfall was variable, with wet conditions covering most of the northern 2/3rds of the state and drier than normal amounts in the coastal plain. In Atlanta, the monthly average temperature was 45.9 degrees F (2.6 degrees above normal), in Athens 45.1 degrees F (1.5 degrees above normal), Columbus 49.7 F (2.5 degrees above normal), Macon 48.8 F (2.5 above normal), Savannah 52.4 F (2.9 above normal), Brunswick 54.4 F (2.9 above normal), Alma 52.4 F (1.7 above normal), Augusta 49.1 F (3.6 above normal), Albany 52.0 F (2.7 above normal), Rome 43.5 F (2.4 above normal), and Valdosta 51.6 F (1.2 degrees above normal). Several record temperatures were set in January. On New Year’s Day, Savannah reported a high of 83 F, breaking the old record of 79 F set in 2017, Alma reported 82 F, surpassing the old record of 80 F set in 1985, and Brunswick reported 80 F, breaking their old record of 79 F set in 1989. Brunswick also set a record high on January 2, with the new observation of 78 F beating out the old record of 77 F set in 1965 and Savannah tied their daily high of 79 F last observed in 1989. Augusta broke their high minimum temperature record on January 1, with the new value of 64 F breaking the old record of 82 set in 1876m and Savannah tied their record high minimum temperature of 61 F on January 3, which was last observed in 1890. 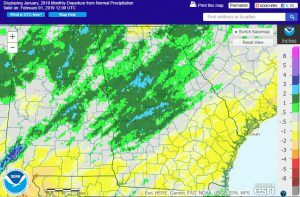 The highest monthly total precipitation from National Weather Service reporting stations was 6.82 inches in Rome (2.00 inches above normal) and the lowest was in Savannah with 2.55 inches (1,14 inches below normal). 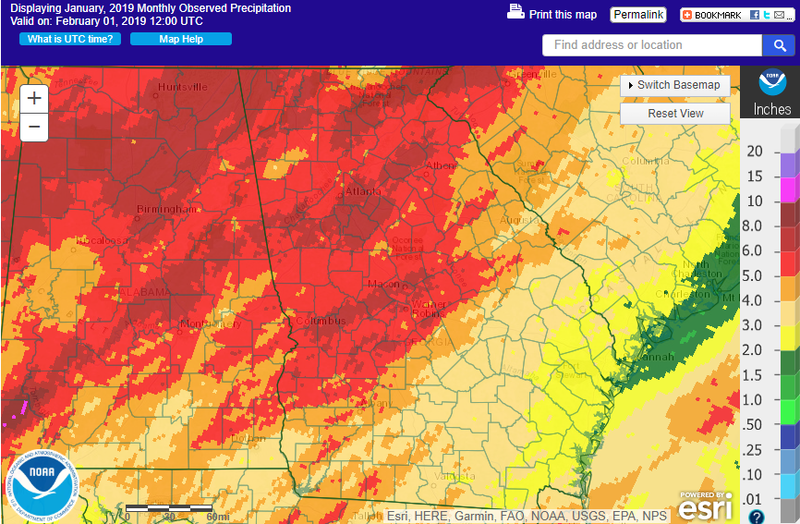 Atlanta received 6.23 inches (2.03 inches above normal), Athens received 5.34 inches (1.29 above normal), Columbus received 5.65 inches (1.80 inches above normal), Macon 6.15 inches (1.91 above normal), Augusta 4.40 inches (0.49 above normal), Alma 3.13 inches (1.13 below normal), Brunswick 2.61 inches ( 0.61 below normal), Valdosta 3.63 inches (0.94 below normal), and Albany 4.13 inches (0.69 inches below normal). Two daily rainfall records were set in January 2019. On January 4, Columbus received 2.33 inches, breaking the old record of 1.75 inches set in 1971. On January 24, Brunswick received 1.58 inches, edging out the old record of 1.55 inches from 1991. The highest daily rainfall total from CoCoRaHS observers was 3.41 inches ten miles northtwest of Ellijay in Gilmer County on January 20, followed by 3.03 inches measured at Fairburn in Fulton County and 3.02 inches at Sasser in Terrell County, both on January 24. 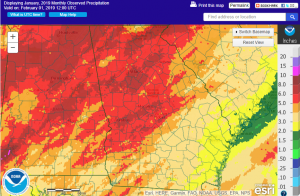 For the month, an observer near McDonough in Henry County reported a total of 9.95 inches, followed by 9.21 inches from the Ellijay observer and 9.18 inches in Acworth in Cherokee County. No measurable snow was reported this month, but traces of sleet and snow were reported in a few northern counties on January 20 and 30. Only one tornado occurred in Georgia in January. An EF-1 tornado occurred on January 4 in southwestern Georgia when a brief tornado touched down west of Zetto in Clay County, damaging a single family home and uprooting some trees. Three reports of wind damage were noted on January 19 in the southwestern corner of the state. There was no drought or abnormally dry conditions in Georgia in January 2019. Cotton farmers are continuing to harvest their crops in January. At the beginning of the month, 10-15 percent of the crop was still in the field due to wet soils, which impeded the use of heavy harvesters. By the end of the month, drier conditions had allowed some fields to be harvested, reducing the amount remaining to 5-10 percent of the crop. Some of those fields may never be harvested due to the severe losses of yield due to Hurricane Michael. Farmers are watching their winter crops carefully due to the wet conditions and are applying fungicide to help prevent the development of fungal diseases early in the season. The outlook for February shows that warmer than normal conditions have an enhanced risk of occurring again throughout the month. The month will start much warmer than normal but will return to more normal weather in the second half of the month. Wet conditions are expected to continue for most of the month. The February through April outlook leans slightly towards colder and wetter than normal as an El Nino is still expected to occur (65 percent chance) and impact the weather through spring. For more information please see the “Climate and Agriculture” blog at http://blog.extension.uga.edu/climate/. You can also visit the University of Georgia weather network web page at http://www.georgiaweather.net. Please feel free to email your weather and climate impacts on agriculture to share on the blog to pknox@uga.edu.